Jacob wrestling the angel is a bibilical story with a number of interpretations. Jews tend to interpret the story as a test given by God to test the resolve Jacob had on his trip. Others interpret it as a test in which Jacob wrestled himself, wrestled his brother in an ongoing battle for supremacy or even Jacob battling a furious and capricious God in an act of defiance. Ultimately Jacob prevailed and though carrying a lifelong limp as a result, remained unbeaten. 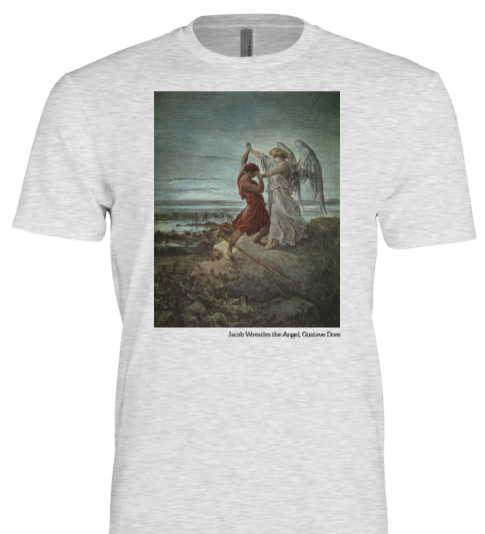 This shirt features perhaps the most famous depecition of the story, Gustave Dore's 1855 woodblock print.